You’re a smart cookie. You know sugar isn’t good for you. 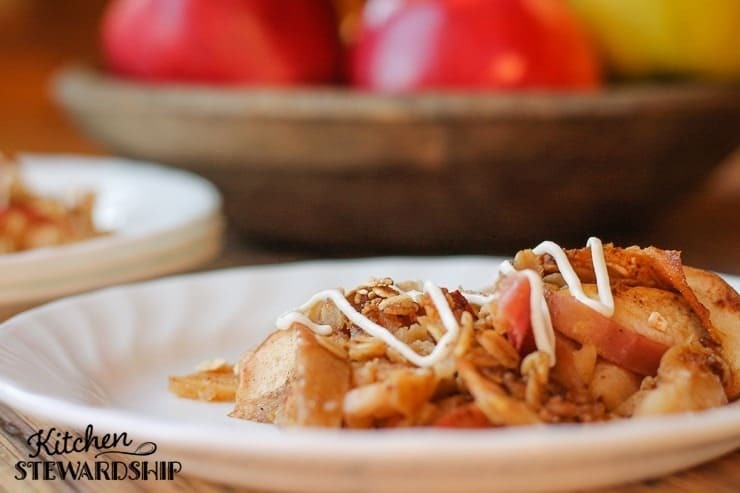 You know you could probably stand to skip dessert, but you’d rather indulge that sweet tooth. 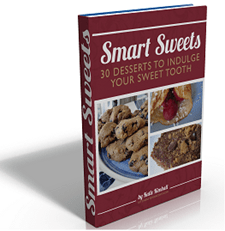 The goal of Smart Sweets: 30 Desserts to Indulge Your Sweet Tooth is to give you options that are way better for you than you’ll find in the grocery store, usually better for you than another homemade version, and sometimes downright good for you. 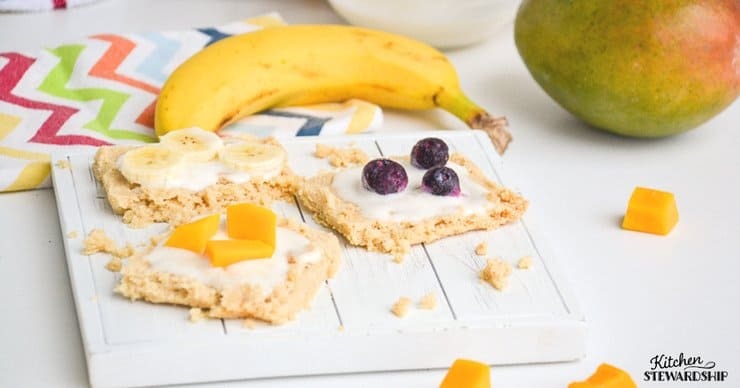 You’ll find less sugar, healthier sweeteners, whole grains, soaked and sprouted grains, no grains, probiotics and even some vegetables in these desserts recipes. If you always feel guilty when you give into sweet things, this book is definitely for you. If you want a great way to slide that resistant someone into eating real food, this book is for you, too. And if you’re just looking for a delicious soaked grain brownie, a birthday cake including whole grains, or homemade chocolate syrup without any high fructose corn syrup, then welcome, my friend: you’re surely in the right spot. Delivered only as a PDF, not a hard copy. 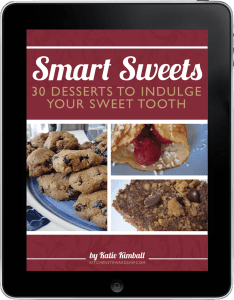 What Recipes are in Smart Sweets? 3. What’s That Sweetener? (a 3-page chart of all natural and unnatural sweeteners, how they’re made, how to use them, and more). In Healthy Snacks to Go I like to say that the centerpiece is the power bars, Larabar knockoffs with 14 different flavor variations. 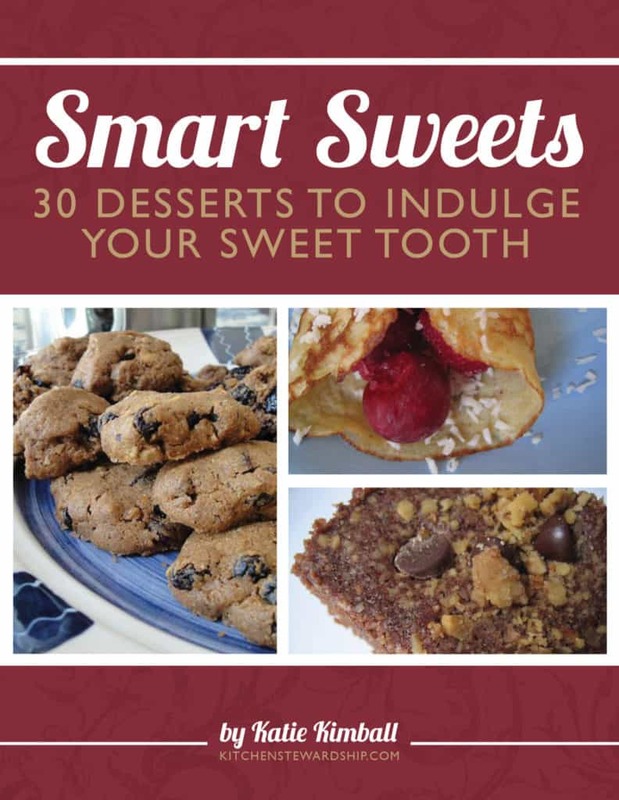 For Smart Sweets, I fiddled a ton with a number of recipes, so for pure variations and perfectionism, let’s choose 3 anchor recipes for the book: the brownies (soaked, sprouted, fudgy, cakey, and even black bean brownies), the coconut macaroons (almond, chocolate, both, neither, and 6 different ways to bake whatever size batch you need), and the apple crisp (in the slow cooker, gluten free, streusel-ish or crisp-ish, etc.). 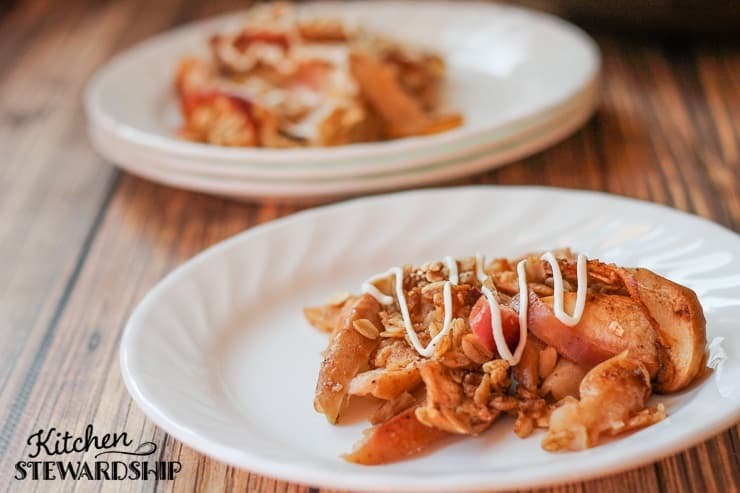 I’m sharing the full recipe of the Apple Crisp, just as it is in the book. If you’re familiar with any of the KS eBooks, you’ll recognize the familiar format of Healthy Snacks to Go and The Everything Beans Book. If the reduced price isn’t tempting enough, the free excerpt might be. Scroll up to the form and subscribe to the KS monthly newsletter to download 21 “sweet” pages to nibble on. I’m a teacher by vocation and collegiate training, and I can’t help it: I teach in this book. 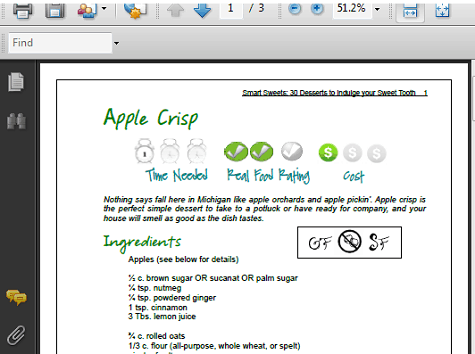 You can expect incredibly clear, complete directions on every recipe. My FAQs get right into your head, and once you’re finished reading them, you won’t have any yourself. 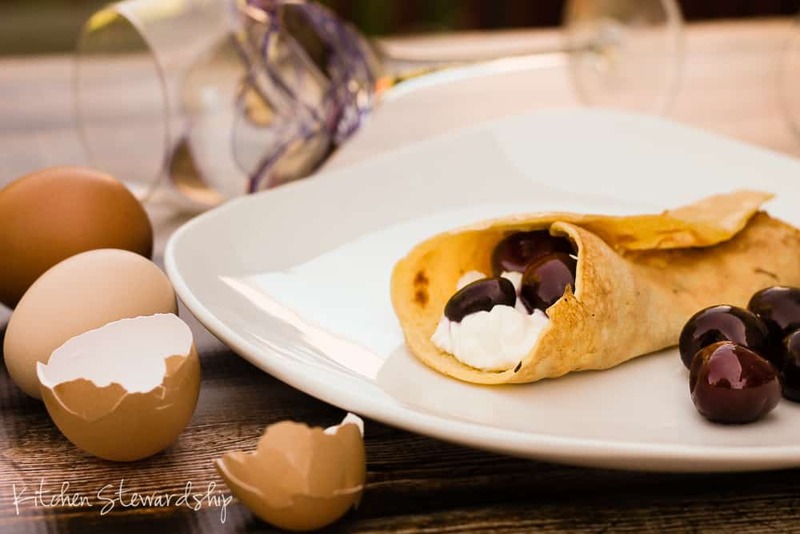 My goal is that even a nervous newlywed with no kitchen experience could follow these recipes successfully and deliciously. Healthy stuff…but also made for baby steppers. I have a few reasons, actually. First, I use white sugar from time to time. When there’s not much in a recipe, there are days when I just don’t feel like coughing up the double and triple price upgrade for maple syrup, sucanat or other unrefined sweeteners. Third, I like to have “food donation” options. Even the most die hard real foodie who feels guilty if they have a bag of white sugar in the house might want a less expensive option when asked to bring a plate of cookies for a bake sale, for example. Many of us don’t have pockets deep enough to feed the best ingredients to the whole world, all the time. Reality is reality, and I like providing options for many different sweeteners, many different variations on each recipe. You’ll find one that works for the philosophy by which you already work in the kitchen. Q: How many recipes are gluten-free? A: Seventeen, 15 of which are also grain-free. Q: How many are dairy-free? Q: How about egg free? A: Many would probably work with egg substitutes, but 15 have been tested egg free. A: There are just a few recipes that require nuts, but for most, nuts are optional. Q: I don’t know what sucanat is. Will I be able to make recipes in the book? A:That’s okay. First, I’ll teach you. Second, sucanat isn’t a secret code word to get into the world of real food desserts. We’ll work through this. Third, you should probably go buy some sucanat after you buy Smart Sweets. Q: What are you going to do now that you’ve finished the book? A: After all the recipe testing for this book, which has been marvelous, let me tell you – I’m thinking I should probably give up all sugars for a month or so…but I probably won’t. I’ll just shoot for smarter sweets. Thanks goodness I’m nursing a baby… But actually, I’ll be releasing the second edition of my first eBook, Healthy Snacks to Go, in just a few weeks! If you currently own it, you’ll automatically receive the update along with a screaming coupon for Smart Sweets. If you are unhappy with Smart Sweets for any reason, including allergies that prevent you from making too many recipes, I will provide a full refund, no questions asked. Browse the table of contents before you buy in the 21 page freebie that’s free to nibble on when you subscribe to the KS monthly newsletter. Scroll up to download your copy today. Proud to boast the cover design of Sarah Dyess. 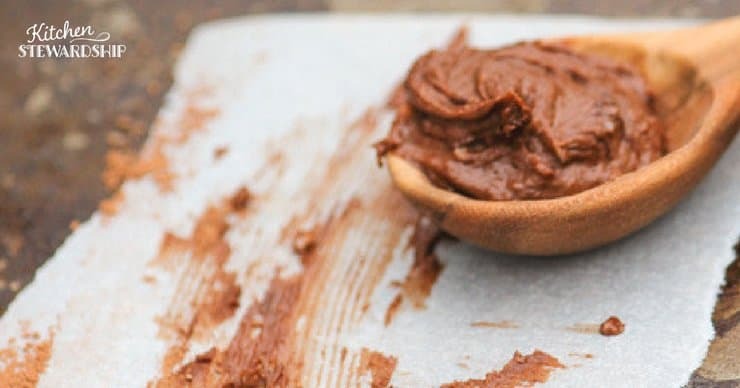 Disclosure: I am an affiliate of MadeOn lotion – we totally work together on many projects and have had fun figuring out all the ways to co-brand a desserts book and lotion made of food. 🙂 Mostly that ends up with free stuff and discounts for you, so I can’t imagine anyone will mind, right? That is fantastic!! Congrats on writing another ebook. I am sure it will be just as awesome as your other ones. Can’t wait to check it out. On my wishlist. Can’t wait! Thank you! Still one of the first 100. A free “My Buttered Life” is wonderful as well – I’ve been wanting to look into that more. I’m SUPER excited about trying the Magic Coconut Pie. I’ve been waiting for that since you first mentioned it on your blog. exciting!!! can’t wait to see and browse all the yummy recipes. Thanks! I just bought mine! I bought it cause I love sweets and want to limit sugar and also cause I love your blog and want to support you! I’ve been waiting for this Katie, I just bought it! Whoa! Did you already sell 100 copies? It told me the code expired. Katie, Thank you for doing this book. I have your snack book and we use it all the time. This is one area that I can use some tried and true recipes. We are making the honey molasses cookies today! No add-ins yet, but these are SO good. I don’t feel bad about making these for Christmas! Bought this an hour or two ago and just made the peanut butter kisses. The three kids that are home are asking me to make them on a daily basis. One of our boys suggested subbing cashews for the coconut some time and I think he’s on to something. Yesterday I tried the Magic Coconut Pie and it was so yummy. I had to use what I had on hand, sweetened coconut. I still used the 1/4 c sugar. We had fresh cranberries on hand, so I added about 3/4c to the blender at the end for a few pulses. The pieces floated to the top and made a pretty and tasty pie. Everyone enjoyed it. Thanks Katie for such a sweet book! Lots of great ideas along with the recipes. great book…cant wait to start baking! i want to make cookies! Wonderful book, would love to try out healthier recipes. If i’ll win the book, the first thing i am going to try the coconut macaroons. 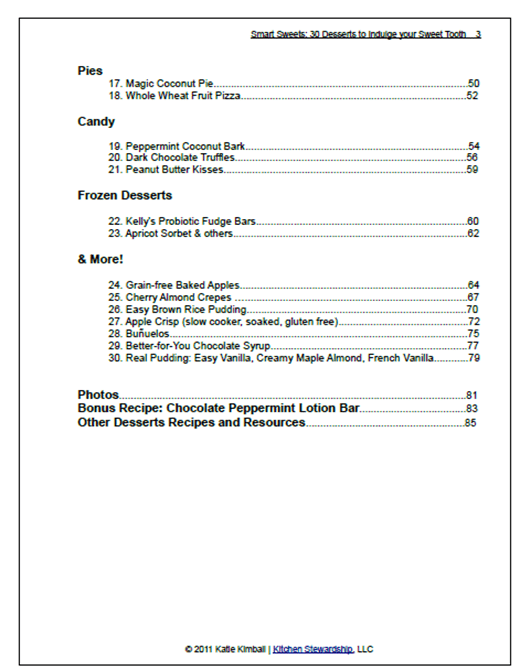 The magic coconut pie sounds interesting, would love to try that one and many more I won’t list. 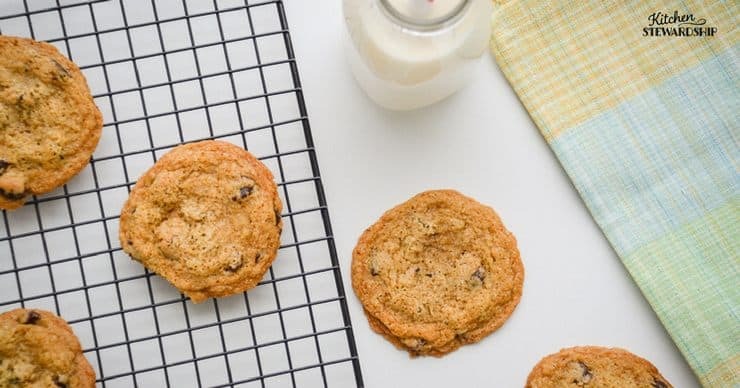 The whole wheat chocolate chip cookies are the recipe that I am DYING to try! Everyone loves chocolate chip cookies and why not explore a new and heathier way to prepare them for my loved ones??? Makes me giddy just to think that I can enjoy sweets that are in fact good for me?!?! If that doesn’t make you smile, then you have no pulse! Just made the soaked fudgy brownies last night and am looking forward to trying them tonight when I bring them as dessert to our non-real foodie friends house for our monthly dinner party! One note, the directions for the soaked version say to add all other ingredients after you have soaked the soaking ingredients for 7-12 hours. I did this, then came to the end of the recipe where it says to sprinkle the batter with 1/2 c. chocolate chips! I had already put the chocolate chips into the batter. Are the sprinkled chocolate chips in addition to what is in the batter, or was I not supposed to mix them into the batter in the first place? Whoops – the chocolate chips are slated for the top, but double chocolate never hurt a brownie that I’m aware of. 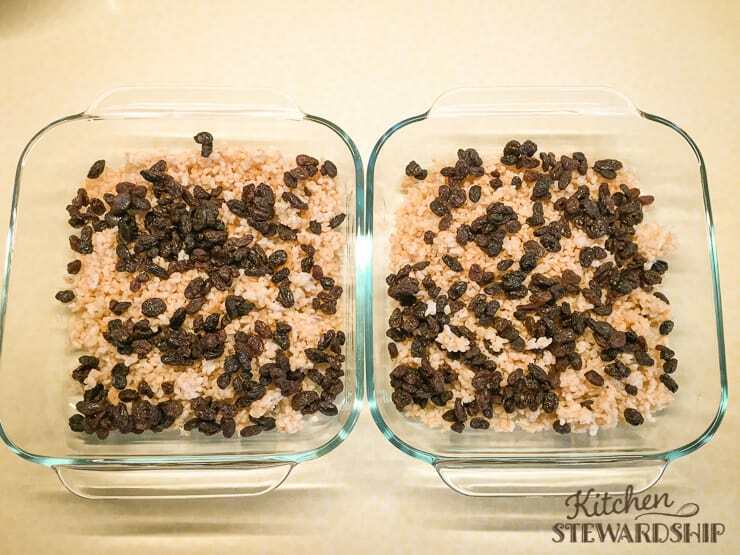 Sounds like I neglected the words “except chocolate chips” to “add all other ingredients.” Sorry about that – my recipe testers didn’t catch it either! Ack! Sorry, Alli Strohm Hyer – I typoed – It’s “VDAYYUM’ – blasted “a” key on my laptop is dying and I didn’t catch it. Phooey on me. Thanks Katie; got the sweet coupon code after updating my Healthy Snacks to Go e-book and yours are the only e-books I’ve ever bought, I knew I had to have this one too! It looks wonderful though I don’t know when I’ll have time to try all the recipes and the new updates both from Healthy Snacks. It sure will make my family happy too! 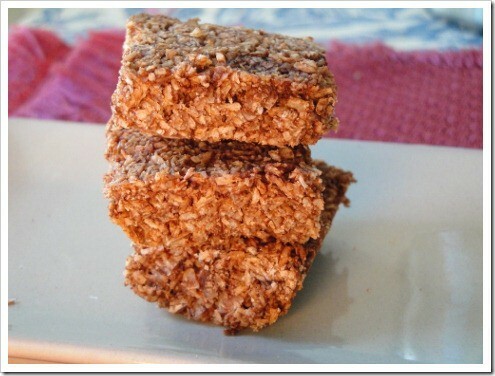 I just made the granola bars and they are awesome! This looks like exactly the type of thing I am searching for! My daughter is almond, egg, gluten free. Is this book for me? 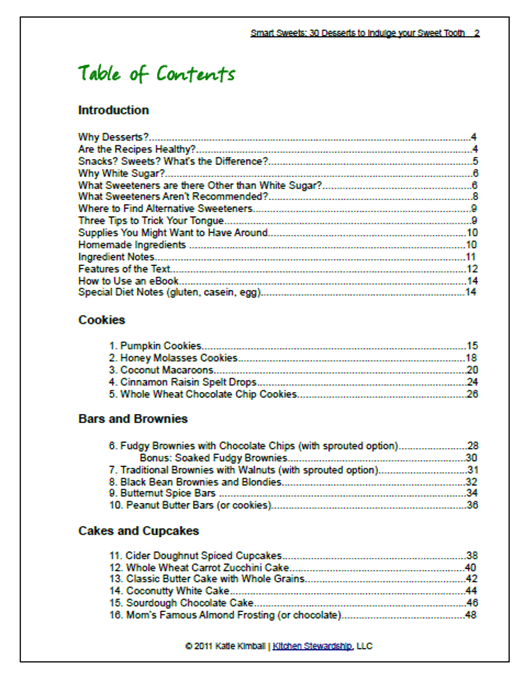 Hmmm, 17 recipes are gluten-free and 15 are egg free (plus some others that should work w/the flax substitute), but some of those that are GF might need some eggs… Almonds aren’t a big player in this book at all.